This frame grab from the Saudi-owned television network MBC (Middle East Broadcasting Center) shows Suleiman Abu Ghaith, the spokesman of alleged terror mastermind Osama bin Laden's al-Qaeda network, claiming responsibility for the September 11 suicide attacks in the United States in an undated videotape broadcast by the Dubai-based MBC 17 April 2002. 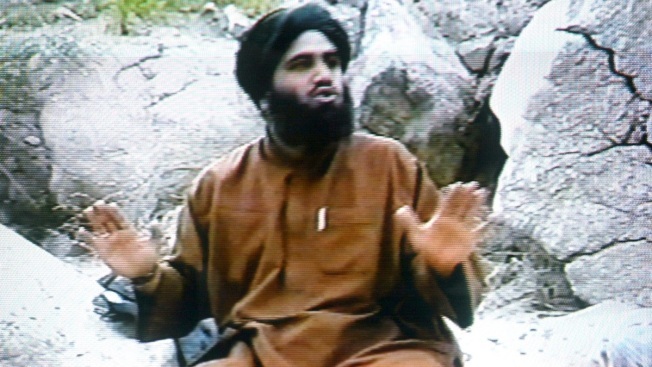 Prosecutors say a New York judge should disallow testimony from the self-described mastermind of the Sept. 11 attacks at the trial of Osama bin Laden's son-in-law. The government made the request Monday in papers filed in federal court in Manhattan. Prosecutors responded to a request by defense lawyers to call Khalid Sheikh Mohammed as a witness at the trial of Sulaiman Abu Ghaith. Mohammed is detained at Guantanamo Bay. He said in a statement in response to questions from Abu Ghaith's defense lawyers that he would not testify. Meanwhile, the defense is presenting its case. It began Monday by calling two FBI agents who accompanied Abu Ghaith to America last year. Abu Ghaith has pleaded not guilty to conspiring to kill Americans.